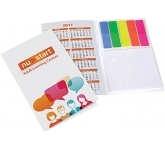 7 reasons to choose promotional post-it notes! When it comes to branded merchandise, you really have to go all out to raise your brand visibility with a solid marketing plan - and every strategy should include branded sticky notes. There is no better way to strengthen your brand than with repeat exposure., the more exposed customers are to your brand, the more they will trust you. 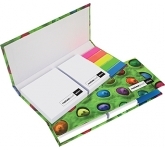 Custom printed products are a proven help you to achieve this and post it notes are one of the most effective choices. These low cost company giveaways get your name out there and compel your potential target audience to view your name every day, therefore, you'll be able to reel them in, one reminder at a time! But, what else makes promotional sticky notes so popular? 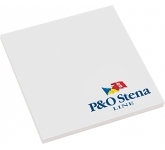 Corporate branded post-it notes are useful products and as with any giveaways you always want to provide your potential clients something they can use. Otherwise, they'll just throw them away the moment after you've handed it to them. 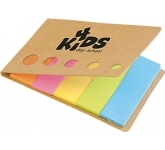 The ultimate practicality of promotional sticky notes lies in their usability. People use them on daily basis to jot down notes and reminders and with your logo right in front of them they will serve also as a constant reminder of you! 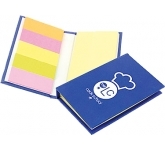 Let's face it no matter what you do, you always need sticky notes and that's why they are such a convenient promotional stationery giveaway. No one is going to say no when a sticky notepad is handed to them, after all, you can never have enough. Therefore, your target audience isn't limited - its unlimited! 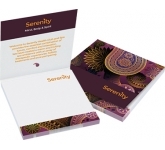 You can also take advantage of certain sectors and events that need branded sticky notes more than others. 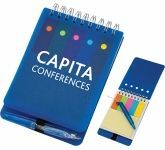 Examples include trade shows, conferences, exhibitions, business meetings and then there are schools, colleges, universities, company offices, councils and charities - the list is endless! It's only logical to leave your sticky notepad on your office desk so that it is easily reachable to write stuff down at any time. When it comes to promoting your business, this visibility is just about everything! When you hand out printed sticky notes, you're not reaching just the people you hand them out to! NO! You are reaching all their co-workers, customers, and other people that walk by their desks. Furthermore, there is no need to make your promotional post-it notes plain or boring. They come in a huge variety of shapes, sizes, and colour options. Therefore, you can make them loud and noticeable. 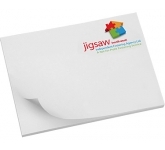 Print them in vibrant colours or eye-catching shapes to uniquely compliment your industry sector or particular marketing activity. That way, they will pique the interest of other people with just a single glance, and when they look at the pad, the first thing they'll see is your brand name and stand out message. Now that's successful advertising! Some company giveaways you have to hand out together for example, you'll probably hand out promotional pens along with your printed notebooks and branded notepads. However, that's not the case with sticky notes. Well, if you don't want it to be. Therefore, if you're on a tight budget, you can always take the easy route and just hand out sticky notes as a stand-alone marketing product. People will still use them, and more importantly, they won't lose or misplace them. Good marketing takes not only time and planning but a lot of money as well. You're probably well aware of the fact that you can't put a price on brand exposure. It's normal to set a specific budget for your marketing campaign, in fact, some companies have huge budgets for these purposes only! 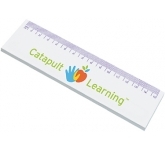 However, that doesn't mean that every promotional item needs to cost a fortune. While some items are inevitably expensive, and you have to wait a long time to get your investment back, promotional sticky notes are just the opposite. They are low-cost, and represent a cheap, yet very valuable product, and they might even be the most valuable weapon in your marketing arsenal. We offer a variety of printing options on our vast range of sticky notes from screen printing right through to the very latest in UltraHD photo print technology allowing us to reproduce full colour images to a standard most can only dream of. 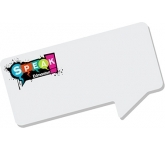 If you are seeking to really make a connection with your brand then why not opt for one of our custom shaped sticky notes which are precision die cut in a huge range of shapes - where bound to have one to compliment your brand! 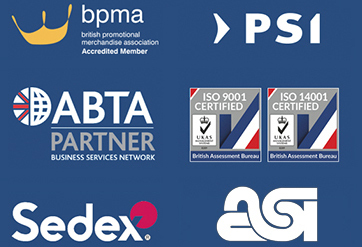 So, if you are looking for low cost, budget or cheap printed post-it notes, and happen to find the same note pads cheaper, with the same specification, just let us know and we will match the price and back it with our industry Award Winning Customer Service - that's our guarantee!! 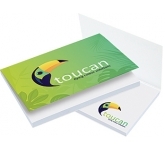 For more information on our custom printed post-it notes or how to use promotional products effectively to benefit your marketing efforts, why not contact us and have a chat to one of our account managers who will be happy to help.